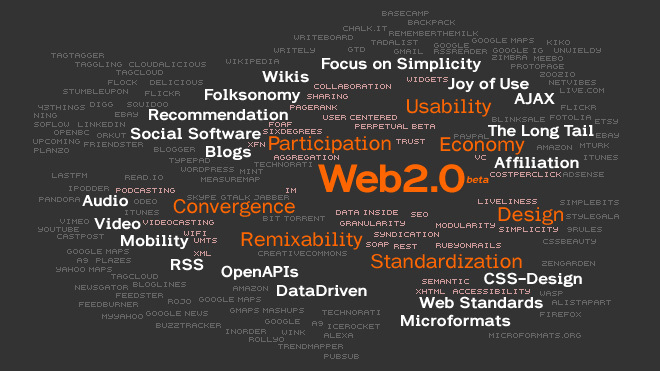 In this post, I want to pull back a bit to focus on some of the meaning behind the term Web 2.0, touching upon aspects of the meme that have driven it to a certain tipping point within the tech community. And no, that doesn’t mean everyone is on board—as dedicated professionals are either embracing the moniker or slapping it down as a marketing gimmick—but one can’t deny the lexicon has begun to reach the mainstream business world. Each year, over the past 10 years or so, the internet has progressively behaved less like a mass of disparate domains—hooked into each other via simple hyperlinks—and more like a functioning network. If you can’t remember 10 years back, 1996 was practically the McCarthy era of the web. There was a good chance you’d be sued if your web site linked to a corporate site without permission. The behavior of the web as a macro entity wasn’t very smart as well. It essentially stagnated as an enabler for people (including developers) to interact (publish, reuse, etc.) with individual sites. The two-way web was there on paper, but an infrastructure forged across a critical mass of domains had yet to be accomplished. Then along came Amazon, blowing the roof off of e-commerce by implementing collaborative filtering. Skip over a few other ingenious domains and Google completely changed the definition of information retrieval within both its own domain and others. The IQ of the web jumped as its big players became smarter, but across a majority of domains, the web was still more of a parking garage for individual vehicles, with individual owners and drivers. Carpooling hadn’t begun yet. Take my home office network as an example. Each day I easily share data between three machines in order to accomplish a multitude of different goals and a subset of numerous tasks. If I’m using my PC and want to alter an image found on my PowerBook, I simply use Photoshop on my PC to grab the data from across the network, manipulate the image and save it back to its original location. I perform similar operations when marking up HTML and CSS on my PowerBook, then hopping on a browser on my PC to view the data in a rendered form. This is my personal realm of shared data; a collaborative, transparent, usable space called a network. It stitches together my various personal computers, allowing my software to access data openly and freely. The label isn’t fancy, because the concept is finite and comprehensible. I own everything, from the hardware to the software to the authentications allowing access throughout. I am the network. A transition to a user-centered web will only occur once we, the web development community, take the well established premise of a finite network and extrapolate its underlying philosophies of connectivity, transparency and usefulness across a potentially unlimited amount of “networked” domains—each with varying business objectives and often at best, a subjective understanding of user goals and tasks. In doing so, the rationale for the 2.0 label will start to become clear, as we’re dealing with an enormous number of variables in an extremely large value equation. We’re living in an entrepreneur’s dream world. Web 2.0 is a useful moniker to latch onto. Without a set of guiding principles, progressive domains that eat, sleep and breath collaborative, transparent and useful user experiences might end up functioning within a bubble, as opposed to influencing the adoption of industry-wide hooks of shared data and patterns. Just as Amazon and Google previously raised the bar in the late 90’s and challenged their competition to innovate or fold, this philosophical approach is a rallying cry for the entire industry. Each of these features within the flickr domain could be studied to find analogous patterns from the macro arena around the web (e.g. posting images is the equivalent to publishing a podcast), but by focusing on one feature, user commenting, we can blow out the possibilities for usefulness across a Web 2.0 environment. While commenting isn’t unique per se, flickr does provide a commenting feature that is very useful. In order to help a user keep up with discourse surrounding their posts, flickr provides a “Recent Activity” screen, which not only presents user comments in context to the images, but notifies you when your image was added as someone else’s favorite. There’s also an elegantly designed page which documents the history of comments that you’ve made across the domain. flickr makes this so easy to track, they even provide an RSS feed for peripheral awareness. Now take this concept from the micro space of flickr and extrapolate it across the macro space of the web and you have the means to track numerous conversations you’ve either started or joined over n period of time. Blogpulse has a similar interface with its Conversation Tracker, but that relates more to trackbacks and the movement of a topical conversation across posts. Interesting, but not personally interesting. The captivating aspect of the localized, recent activity screen from flickr is through the exposure of an involved conversation, rather than an uninvolved and evolving perspective. When flickr was without the recent activity feature, I was never able to remember what images I previously commented on, so in turn, my participation level was reduced. With the feature, I comment much more often, as the connection between me and other people’s information objects is now tangible. Now, apply that same concept to the web. What would a recent activity interface centered on your comments from around the web do for your continued contribution to public discourse? This is only one idea for how the concepts behind the Web 2.0 meme can change the way we look at the web, moving from a centralized group of branded domains to a functional network of decentralized, shared data, information and applications.